Not like I’m opinionated or anything, but if you are teaching students younger students (or struggling students) algebra and you are not using Algebra Tiles, then you are missing the boat! Not that I can be too judgmental, I had them on my shelf and missed fabulous opportunities to use them all year. I bought them solely for multiplying polynomials with my 7th graders. I only bought a few sets because I didn’t want to waste too much money if we all hated them. I have taught older students Algebra (Pre-Algebra, Algebra IA, Algebra IB, Alg II for seniors) many times in the past and never used them. With those classes the kids had seen Algebra before, sometimes many times, and I didn’t think it would benefit them very much. The tiles seem very elementary, not to mention a lot of trouble, and I was afraid it would be, “too little, too late”. So yeah, I was WRONG again. x + x = 2x and x times x = x^2. Plus, they are young (12-13) and thus more concrete thinkers so I felt it was a good tool to use for this age group. I wanted to explore taking them from the concrete to the abstract with Algebra Tiles. I was skeptical but hopeful. I’ll try anything once! However, once I pulled these things out though there was no stopping us! For the first time ever, my students did not mix up 2x and x^2. W-O-W. If you’ve taught Algebra before, you know that is big. My students knew not only what it meant, but what it looked like. They knew why the 2x and x^2 were different. They did not ask me a gazillion times if it was 2x or x^2. And if they did, all I had to do was pull out three tiles and viola – instant understanding. I mean, HELLO – Look at them! They look nothing alike! You cannot ask for a better explanation than that! One thing that I discovered that really helped my students is how you can represent negatives with the tiles. This was wonderfully helpful with multiplying a negative through a polynomial. My kids always stumble over that or even “forget” it. However, since we have been doing the tiles they can see what they are doing and are no longer forgetting it. Bonus! Illustrating the distributive property. As fun as “The Claw” is, seeing is really believing for my students. Negative Operations – The opposite of a positive number is it’s negative. For the tiles, to get the negative (or opposite), we flipped the tile over to the other side. (one side is yellow – positive, the other is red – negative). This can even illustrate basic concepts, like – (-4). What is the opposite of -4? Flip it over and see! Multiplying a negative + distributive property. 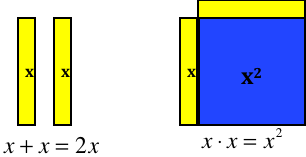 – (x – 3) or -2(x – 4). When you see – (x – 3) you are taking the opposite of (flipping) everything inside of the parenthesis. Equation solving – divide by a number. 3x = 6. Three x’s = 6, so one x must be 2. Then, I would split the x’s and line up the constants on the other side, dividing the x’s. Equation solving – FRACTIONS. x/2 = 3 . If HALF of an x = 3, then what does an entire x equal? Multi-step equation solving – This was especially helpful when I was teaching multi-step equations. With tons of tiles spread out all over the paper, the students could easily SEE that of course I needed to combine like terms before trying to get x alone on one side! Of course I still do my crazy songs, dances and rhymes so that math will be stuck in their brains – FOREVER. (And yeah, I just LOVE to sing and dance!) But, I think that it is important for every student to know what they are doing, and not to just be following random steps! So, one day in the future, when they can’t get our annoying equation song out of their head, maybe they will also recall the Algebra Tiles, and remember WHY x times x = x^2 and NOT 2x. This entry was posted in Activities, Pre-Algebra by I Speak Math. Bookmark the permalink. I felt the same way, I had never seen them used either. I first just bought two sets to try them out for myself. I liked the foam ones better because they made less noise. http://www.enasco.com/product/TB20570T However, I don’t know how “sturdy” they will be in the long run. The plastic ones may have been better. You can also play with them online instead of buying them. I have edited my post above to include some links. Good luck! They don’t know what the tiles are, so you can’t find them with “algebra tiles”. (2) You don’t have to wait until your whole school or district offers PD on a new tool or technology, you can find your own professional development on what you need. For example, I offer one-on-one PD sessions with teachers via Skype where we spend about an hour doing exactly what you need (e.g. I need to understand how to do a lesson on factoring quadratics using algebra tiles). You can also find many free options if you’re willing to do some searching online and wading through some not-so-good things in order to find the ones that are good (e.g YouTube). Feel free to contact me if I can help: http://www.rimwe.com. Thanks for sharing your thoughts on the use of algebra tiles in math class. I think most teachers are aware that they exist, but I don’t think most (including myself until recently) really know how to use them effectively. As each class of students in grade 9 math come and go, I realize more and more that kids really don’t know what they are doing in math. Those who appear to be successful (ie: high marks) typically have a better working memory and can memorize procedure. However, they don’t necessarily know “why” they are doing what they are doing. This is especially true when working with algebraic expressions. Students memorize rules and when they forget the rule or apply them in the wrong situation, everything falls apart. Looking forward to start trying to make the math in my class more visual using algebra tiles from simple exponent laws, collecting like terms and on to distribution and factoring.